Tahoe Donner is one of the largest sub-divisions of Truckee, a small vacation town within itself, nestled high above the bustling center of town, just minutes from Downtown Truckee and I-80. This community is perfect for vacationers that are looking to experience an active Lake Tahoe Vacation. Continue reading to see our amazing Tahoe Donner Vacation Rentals today! Tahoe Donner is a 3,300-acre community consisting of 5,948 residential lots. Nature does a fantastic job with a diverse palette of pines, willows, and brush; wildflower-blanketed meadows; wildlife just out of your doors; mountain streams; breath-taking views and magnificent snow-capped mountains. Elevation in Tahoe Donner ranges from 6,200 feet to an impressive 8,000 feet! Although this expansive mountain community may appear remote, Tahoe Donner renders a dizzying array of amenities that require little to no travel. The community of Tahoe Donner is entirely owned by the property owners and hosts a complete package of World-Class Recreational Amenities. Our guests that rent a vacation home in Tahoe Donner receive access to most activities below. Enjoy winter activities ranging from downhill skiing at Tahoe Donner Downhill Ski Area and 51 trails of cross-country at the Cross Country Ski Center, to sledding and tubing with the little ones at The Snowplay Area, Tahoe Donner ski area is known as one of the best places to learn skiing and also very family oriented. Summer time in Tahoe Donner is nor short of activities either, imagine starting your day with a challenging round of golf at the Tahoe Donner 18-hole championship golf course, followed by a cool drink on the deck at The Lodge Restaurant, or enjoy a tennis match at one of our 11 tennis courts finishing off the day with a relaxing boat ride at Donner Lake, just a short drive down the hill, or just relax on the private beach on Donner Lake. The Beach Club offers a long sandy beach, a picnic area where you can enjoy a BBQ with the most amazing view or launch your boat and enjoy the scenery. Tahoe Donner is a year-round playground, visiting in fall or spring? Don’t forget to check out our trail map and end your day at the conveniently located state-of-the-art fitness center, available for homeowners and their guests. Sweat it out in the cardio or weight room or just come to relax in the hot tub. The recreation center is outfitted with two swimming pools, hot tubs, sauna, steam room, a weight and cardio room. Alder Creek Campsite offers another option to vacation rentals, go ahead and hike the 1300 acres of preserved terrain, or take a horseback riding lesson at the Equestrian Center and explore wildlife on the Sierra trails. We’re sure you’d like to hear at least a little about our North Lake Tahoe vacation homes! Everyone knows that your accommodations can make or break your vacation getaway, and because we understand the importance of our position in your plans, we go above and beyond to ensure your Tahoe experience is unforgettable. Turn the key on a Tahoe Donner cabin and prepare to be wowed! Colorful slate floors lead the way to the heart of the home. The kitchens in our cabins are spacious and warm, designed to allow multiple chefs to work in harmony with each other; stainless-steel appliances, custom cabinetry, and leathered granite countertops prove that form and function working together can be a beautiful thing. Relax in living areas with log walls, stone fireplaces, and leather furniture cozy enough to nap on, yet stylish enough to be featured in the latest home décor magazine. Decks with views of the mountains and the lake, bedrooms filled with comfy beds and offering deep sleep with only happy dreams, and bathrooms with soaking tubs and soft white towels—each room is better than the one before! If a ski lodge is more your style, however, we have you covered as well; our Tahoe Donner Ski View Retreat offers golf course access, mountain views, and a laidback vibe that makes you never want to leave! You’ll find spacious rooms with high ceilings, a fully equipped kitchen with views of the tranquil woods behind the home, and bedrooms filled with unique and comfortable furnishings—the headboard constructed of retired skis is one of our favorite whimsical touches! The jetted soaking tub in the master bath offers a relaxing place to recuperate from those extra runs down the slopes; it’s details like these that make our homes the most desired in the region! As beautiful as our North Lake Tahoe vacation homes are, there’s still more to look forward to when staying in a Tahoe Signature Properties home. From golf course access and community pools to high-speed internet and gas grills, our luxury amenities will always leave a good taste in your mouth! Community resources such as gyms, rec centers, pools, golf courses, and hot tubs come standard, giving you a vacation experience that doesn’t end at the door to your home! We know that the best parts of any vacation are often the simplest joys: a dip in the pool at the end of a hot day, practicing your putt on a putting green, or sitting in a hot tub on the coldest winter days. For a map of Trails in Tahoe Donner please see Tahoe Donner Trail Map ! If you have any questions about Tahoe Donner please feel free to call or email us, we’ll be happy to answer any questions. 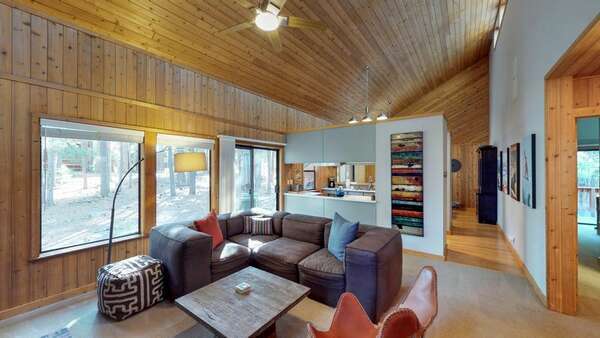 Tahoe Signature Properties is proud to offer vacation homes, condos and cabins in Tahoe Donner.